Have you any exciting plans this weekend? My family and I, will be cleaning up are garden. Pulling weeds and turning the dirt, so that we can get ready to plant our vegetable garden!! Love seeing my little ones pull the veggies right off the vines and eat them!! 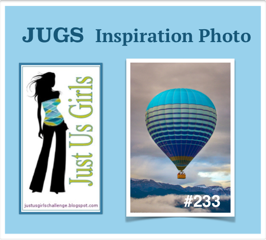 I am here today to share my 4th project as guest designer at "Just Us Girls" Challenge blog. This weeks challenge is a Photo Inspirational photo. I took the literal route and used the hot air balloon, clouds and colors. 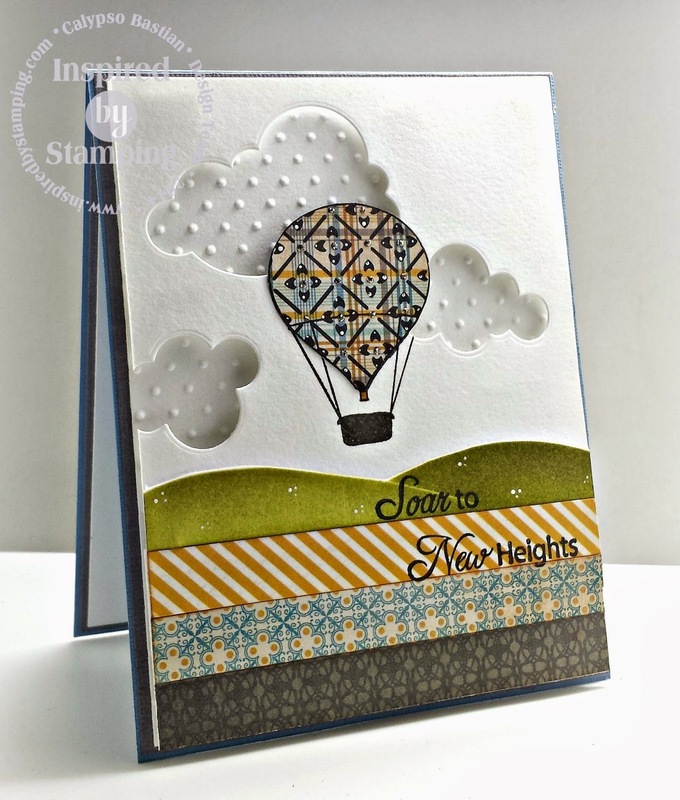 For my card today, I am using an older stamp set from Inspired by Stamping: The Sky's The Limit. Everything about the stamp set was very appropriate for this weeks challenge. My patterned paper is from MME: Oliver. The clouds are dies from PTI, dot embossing folder from Sizzix and distress ink. So I hope that you will let your imagination soar this week and join us. Such a fabulous card -- love the cut out clouds and the overhanging balloon!! This is AWESOME!! Love all aspects! Have fun gardening with your family! Calypso, So impressed with this card as I already mentioned! Hope you have a great day with the family! HUGS! Beautiful card, Calypso! Love the gorgeous papers and the fun way you made the clouds....so cute! This is soooo cool! Love it. Your card is so clever and elegant. Love it. (Did I say that before?) Thanks for playing along with the Daring Cardmakers this week. Just taking a look at your card is soaring to new heights. Love the clouds literally in the background. So clever. Love it. J'adoore ! Cette carte est ravissante ! J'aime l'utilisation des nuages et de la texture ! I love it! Those clouds are so cool and love that balloon. Once again you nailed the challenge.